THE TRANSITION PROCESS: THE SIMPLER WAY PERSPECTIVE. When the nature of the global predicament is understood it is evident that there must be transition to a society in which rates of resource use are far lower than they are today, probably around 10%. This can only be done if most people live frugally in relatively small scale, highly self sufficient, cooperative and self-governing communities, drawing mostly on local resources. These communities cannot be run by the state; they require a high level of conscientious citizenship, volunteering, mutual concern, cooperation and all members directly involved in governing and running their community. These are basically Anarchist principles. Similarly, if there is to be successful transition to a sustainable and just society the process must follow an Anarchist strategy whereby a radically new world view emerges and ordinary people focus on building the new systems within the old. This means that it could be a gradual and peaceful revolution … although its probability of success is poor. There is rapidly increasing realization that consumer-capitalist society is not satisfactory and transition to something quite different is necessary. Unfortunately however there is much confusion about both the alternative goal and how to get to it. My argument is that when the present global situation is understood it is clear the alternative has to be some kind of Simpler Way, and that there is only one general way we can get to it. We cannot sensibly discuss transition unless we first clarify the situation we are in and the required alternative. Here is a brief summary of the Simpler Way perspective on these issues. The second fundamental fault in consumer-capitalist society is its massively unjust global economy. It is driven not by need but by allowing the few who own most of the capital to produce whatever will maximise their profits. As a result richer people get most of the world’s resources because they can pay more for them, and the industries developed are mostly those which produce what richer people want. The inevitable result is that the rich get richer and there is massive neglect of urgent social and ecological needs. There cannot be peace or justice in the world until the rich countries stop hogging most of its wealth and begin to live on something like their fair share. This cannot be done without scrapping the present capitalist economy, and the values that drive it. These commitments to ever-increasing material wealth and an economy driven by profit, market forces, competition and growth are the basic causes of accelerating global problems, including rising inequality resource wars, the poverty of billions and loss of social cohesion. Much simpler lifestyles, far lower per capita resource consumption. Mostly small, highly self-sufficient local economies, putting local resources into meeting local needs. When petroleum becomes scarce there will be no choice about this. Much more cooperative and participatory ways, enabling people in small communities to take collective control of their own development, to include and provide for all. We must develop commons, co-ops and working bees. Participatory town self-government, The important decisions about the development and running of the town must be made by town assemblies, local committees andreferenda involving everyone. The town must be have as much control over its own fate as possible. A new economy, one that is not driven by profit or market forces, that has no growth at all, that involves far less production and work than the present one, and focuses on needs and rights and the quality of life of all. It might have many private firms anda market sector, but there must be (participatory, democratic, open and local) social control over what is developed, what is produced, and how it is distributed. All must be provided for, meaning no poverty or unemployment and everyone having a livelihood, the capacity to make a valued contribution. New values. These communities cannot work well unless people shift from the present individualistic, competitive and acquisitive orientation to a world view focused on being content with frugal sufficiency and living within a supportive community in which all enjoy a high quality of life. There must be conscientious and socially responsible citizens who prioritise the public good. It is most important understand there is no choice about this; The Simpler Way is not an option among many. If the foregoing limits to growth analysis of our situation is correct then a sustainable and just society must have these elements. Recognition of this has led to the emergence of the De-Growth movement, and many people in Global Eco-village and Transition Towns Movements are now attempting to move towards these goals. A good illustration of how only localisation can dramatically reduce resource demand is given by egg production. The present commercial-industrial way involves global networks of farms, factories, chemicals, ships, trucks, battery chicken sheds, supermarkets, computers, satellites, people with degrees, advertising, packaging, soil nutrient loss and “waste” removal, all generating a huge energy cost. But eggs produced in backyard chicken pens or small local farms involve almost none of those costs. Nor does fruit from community orchards planted throughout settlements and managed by working bees. In many Eco-villages voluntary committees and people spontaneously coming together to do things eliminate the need for lots of middlemen, professionals, bureaucrats, transport and infrastructures. IMPICATIONS FOR THINKING ABOUT THE TRANSITION. The foregoing account of our situation and the required alternative society has decisive implications for the transition process, and it shows various current efforts to be mistaken. It makes clear that the focus must be on helping ordinary people to see the need for moving towards a simpler way, and to recognize that this would be a delightful liberation. The focus for our efforts at this point in time should not be the at the level of the state or the normal political party arena. The transition can’t be initiated or managed by state-level authorities. Obviously the new highly self-sufficient and self-governing local communities sketched cannot be built and cannot work unless the people understand clearly why this is the way we have to go and unless they find it attractive. The new communities have to be motivated by conscientious, eager, socially-responsible, caring citizens who are content to live frugally and cooperatively and are not interested in getting rich, and prioritise the welfare of their admirable town and enjoy contributing to it. Thus the initial problem is to do with culture, not with the economy or power. In addition there is the logistic problem; only the people in local communities can make the right decisions and run things well, because only they are familiar with the local environment, soils, people, history, traditions, needs and problems. In addition, centralised state bureaucracies will have neither the resources nor the administrative capacity to run millions of towns and suburbs. Thus the transition strategies being pursued by most green people and most red-left people are mistaken, because they are aimed at getting the state to solve the problems. In addition green political movements are mostly reformist; they are not against affluence, growth, the market system or capitalism. They fail to grasp that the consumer-capitalist system causing the big problems cannot be reformed to solve the problems. It must be scrapped and replaced by a totally different economic system. Red-left movements see the need to replace capitalism but most fail to see that a sustainable society cannot be affluent or centralised. The main problem group, the basic block to progress, is not the corporations or the capitalist class. They have their power because people in general grant it to them. The problem group, the key to transition, is people in general. If they came to see how extremely unacceptable consumer-capitalist society is, and to see that The Simpler Way is the path to liberation then the present system would be quickly abandoned. The battle is therefore one of ideology or awareness. We have to help people to see that radical change is necessary and attractive, so that they enthusiastically set about building and running the new local economies. Therefore the key to this revolution is cultural; it is to do with ideas and values, not economics or power. They come later. The new ideas and values we need contradict some of the taken-for-granted assumptions that have driven Western society for more than two hundred years. They define the historically novel revolution we have to work for. When the goal of the revolution was industrialized, centralized, resource-intensive societies delivering affluent lifestyles to all people it aligned with Enlightenment ideas and values. But in our situation satisfactory revolution requires some of those core ideas and values to be abandoned, most obviously the notion of “progress”. So there is no point in appealing to existing governments or global institutions to undertake the required changes. Governments have no choice but to make the consumer-capitalist system work. If they don’t deliver more economic growth they will be faced with increasing unemployment, recession and discontent and fierce attack. Politicians could make no move in the right direction unless there had first been enormous change in the ideas and values of the mass of people. Thus the essential transition task must be working to bring about those grass roots changes. It should be obvious that the required society must be post-capitalist, that is, a “socialism”: of some kind involving social control over the core economic functions. Most green thinking and action fails to grasp this and is focused on trying to reform capitalism. But the foregoing discussion makes it clear that traditional left transition thinking is also mistaken, because it focuses on attempting to take state power and it assumes that the changes can be driven through from there. In previous revolutions that made sense, but they were essentially about attempting to take control of society from the ruling class … and then run the same old industrial-growth system (more justly). Anarchists such as Kropotkin and Bakhounin who wanted to see a revolution to self-governing communities realized that this was not possible unless people understood and embraced the ways and values that would make these communities possible. Thus they saw that the initial task is to develop those dispositions, and that it is a mistake to prioritise the taking of power or control of the state. If you had given them state power on a plate they would have turned away knowing that it is of no use. It can’t create cooperative autonomous citizens who will run their own villages well. They urged revolutionaries simply to get on with the task of developing in people the awareness that will motivate self-government. If people don’t rise to the opportunity to take control of their own affairs this means there is a lot of consciousness-raising work still to be done, so get on with it. Don’t waste your time trying to confront the ruling class head on or take control of the state from them because that can make no contribution to raising the crucial awareness. When the awareness-raising job has been well-enough done there will be little or no need to confront or fight; people will just vote with their feet and ignore the old ways and build the new ones, and the faulty old structures will be dumped, possibly with relatively little fuss. Let us consider further the confused chicken-and-egg logic in the ”take state power” view. There are only two ways that the control of a state intending to implement The Simpler Way could come about. The first is via some kind of coup whereby power is seized by a vanguard party which has that goal. In our situation this is not worth much discussion. The second path would be via the election to government of a party with a Simpler Way platform. But that could not happen unless the cultural revolution for a Simpler Way had previously been won! We could not get control of a state that is committed to Simper Way principles unless there had been an election in which most people voted for a party with that platform. But that couldn’t happen unless most people had previously come to endorse The Simpler Way … and if that had happened they would have been building the new local economies long before the election! Getting control of a state committed to the new ways will be a consequence of the revolution (… its Stage 2, below.) The core of this revolution will be the advent of the new world view and values. Thus it is not sensible to put much energy into fighting directly against the system here and now. Consumer-capitalism has never been stronger than it is today (… although it is in the process of self-destruction.) The way we think we can beat it in the long run is to ignore it to death, i.e., to turn away from it and start building its replacement and persuading people to come across. The Anarchists see this as working to “Prefigure” the good society here and now within the old. The purpose is partly to start bringing the new systems into existence, but more importantly it is to establish the examples that will help others to see the sense of the new ways as the old system increasingly fails to provide for them; i.e., the purpose is mainly educational. The second stage of the revolution. The foregoing discussion has been about Stage 1 of this revolution, that is, the development of localism, involving both the creation of new citizen-run institutions and more importantly the spread of the new world view. Stage 1 is actually well underway, although it has a very long way to go. There are many people now involved in inspiring Eco-village and Transition Towns initiatives. However there are severe limits to what can be achieved in Stage 1. The local economies being built today cannot rise to a high level of self-sufficiency, or independence from the national and global economies, and they cannot reduce their “footprint” very much. They will always need many goods and services that they cannot produce for themselves. It is not satisfactory if a town or eco-village runs itself well but uses bolts, light switches, tooth brushes, shoes and salt imported from a national or international economy that is unsustainable and unjust. Our ultimate concern must be transition to sustainable and just national and global economies, and this will involve the most enormous, radical and difficult changes in national and global systems. It will be necessary to plan and regulate a great deal, reverse economic growth, reduce the amount of trade, investment, industry, producing and consuming by maybe 90%, prevent the market from being a major determinant, and somehow engineer the relocation of large numbers of people from industries being phased out. It should not need to be said that there are many kinds of socialism/anarchism, and the best known ones are emphatically not what we want. Unfortunately the term is usually taken to mean that the state bureaucracies decide and run everything, but it basically means not allowing what happens to be determined by competition for profit within the market. What we must have is sufficient control over the working of society to ensure that what is best for people and the environment is done, and control in the hands of all people not in the hands of ”government”. Thus most aspects of society might not need any control at all, while we organise and regulate only to make sure that needs in some areas are attended to. For instance most production might be via small privately owned farms and firms, and there might be a place for a market system to operate, e.g., in determining what type of bicycles are to be produced. Not just terminating economic growth but reducing the amount of producing and consuming going on must be cut dramatically, possibly by 90%. Preventing market forces from determining what is produced and what is developed. More or less scrapping the finance industry. Far less capital will be needed and in a zero growth economy money cannot be lent at interest. Completely eliminating many industries (e.g., advertising), and enabling those who worked in then to move into new town-level activities. Coordinating the redistribution of the much-reduced amount of manufacturing, mining, energy and broad acre farming capacity needed, so that all towns and suburbs have a sufficient share to enable them to pay for the imports they need from further afield in the regional and national economies. Dealing justly with discontent, bungles, disputes and resistance. So the Eco-Socialists are right in saying that these changes must be carried out at the state-level, but the Eco-Anarchist sees that they cannot be undertaken until well after Stage1 of this revolution has been achieved. How might this new state come into existence? Here’s what we have to hope and work for. As local economic self-sufficiency develops communities will become more aware of their limits, especially their need for inputs from the wider regional and national economies. Towns will need chicken wire, poly-pipe, 12 volt pumps, shovels, etc. which they cannot produce for themselves. Hospitals and universities will still be needed, and (some) big and centralized industries such as for steel and cement. It will be rapidly realized that the national economy must be restructured to provide towns and suburbs with the (relatively few) basic inputs and services they need. This is the mechanism that will generate the mass pressure for transition to a very different kind of national economy and a very different kind of “state”, i.e., one that serves the local communities and is under their control. Towns and suburbs acutely aware that their fate depends on being able to get simple but crucial inputs will start to demand that states gear their activities to this end. Before long they will go further, developing systems whereby their delegates are involved in the state-level discussions, decision making and restructuring. In time this will lead to full citizen control via the classic Anarchist “confederations” model of higher-level issues being dealt with by delegates from the towns who take all proposals back down to the towns for acceptance or rejection. Participatory democracy, government by all as equals with none having any power over others. Thus town self-government via discussion, assemblies and committees. “Subsidiarity”; dealing with issues at the lowest level possible; avoiding centralisation. Focusing on working out mutually beneficial arrangements, hence enabling synergism. Spontaneity; citizens come together to do things and solve problems, voluntarily,with little or no need for formal arrangements, bureaucrats or professional politicians. Cooperation, concern for the other, for finding consensus and for the good of all. Recognising the fundamental importance of the ideas and values held by all; a goodsociety cannot be imposed but most derive from the good will and sense at the grass roots. Prefiguring; building elements of the new society here and now, as the basicbeginning point for revolutionary change. This vision has the important merit of enabling us to enjoy aspects of post-revolutionary society here and now, especially the experience of community solidarity in a crucially important cause. The focus is mainly positive, as distinct from being on attempting to fight and defeat capitalism before being able to build and enjoy new ways. And it holds open the possibility that this revolution could be relatively peaceful. What should the activist do? The answer is clear. Firstly, work hard at spreading The Simpler Way vision. 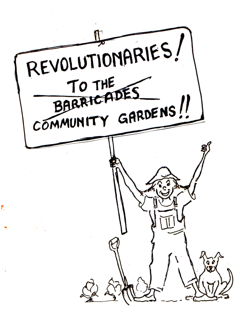 Secondly, get involved in groups trying to prefigure aspects of it, such as community gardens, voluntary Simplicity, Transition Towns and Eco-villages…. but do this mainly in order to be in the best position to develop awareness of the need to transition to The Simpler Way. However it is important to avoid some serious mistakes evident within these movements today. One is the assumption that it is sufficient just to work at finding those new ways we can set up. This theory-less “Just do something – anything” strategy is explicitly endorsed within the Transition Towns movement (See Note 5.) It fails to grasp the need to work on developing two crucial understandings. The first is the need for the town to work towards taking collective control of its situation. It must get to the stage where people come together and say things like, ”Hey, we have around here unemployed people, homeless people, lonely old people, bored youth... what are we as a town going to collectively do about this?” This goes beyond establishing individual “enterprises”, even though some are co-ops, to begin taking town responsibility and control over meeting some of the town’s needs. This is setting up an Economy B below/beside the normal market and profit driven Economy A, to attend to things it does not do. In the long run Economy B might totally replace Economy A, but we might find that there can be a (minor) role for it. A second major problem is the failure, indeed refusal, to think about the fact that eventually capitalism has to be replace by a “socialism” of some kind. Much/most thinking within non-Left alternative movements are merely reformist, operating on the wishful assumption that some tame version of capitalism can solve the problems. The issue needs to be got onto the agenda, towards the day when towns will push through the big restructurings noted above. Stage 1 of this revolution is underway. Intense discontent with the system is building up as large numbers realize that it is not going to provide for them, and many movements are starting to build their own local alternatives. However at this point in time few of these people realize that the goals have to centre on simple not affluent lifestyles, on communities taking control of their local affairs, and on eventually getting rid of capitalism, control by market forces and profit seeking. But these steps will be greatly accelerated when the scarcities start to bite. As oil supply dwindles, GF2 is triggered and economic depression sets in, jobs and supermarket shelves will be savagely hit…and minds will be wonderfully concentrated on the need to build up local self sufficiency! The last thing we want is a sudden collapse of the economy. We need a slow continuation of the present deterioration so systems remain in place to give increasing numbers of people the time and materials to work on remaking their localities. Unfortunately we are not likely to have enough time for a smooth transition. Ahmed (2017) has shown that oil could be more or less unavailable in ten years. GFC2 will probably hit well before then. But that makes no difference; given the limits and the impossibility of industrial-affluent options we must do what we can to transition to some kind of Simpler Way. The more who adopt it before the crunch the better the chance that the sane option will be taken after it. 3. Ahmed, N., (2016), Failing States, Collapsing Systems, Dordrecht, Springer. 4. Avineri, S., (1968), The Social and Political Thought of Karl Marx, Cambridge, Cambridge University Press. 6. Smith, R., (2016) Green Capitalism; The God that Failed, Institute for Policy Research.